This was inspired by friend Wolfie and I tip my hat. Our view differ and still he stops by. Gotta respect that. Rhetoric comes at us from all sides these days. Wolfie putting up with mine is the act of a gentlemen. We don’t have troubles looking at finances base on our circumstances. When we move beyond the thousands that make sense day-to-day, we don’t have a good frame of reference and are often at the mercy of those who play in such circles. The income tax was instituted in 1913 as a wartime measure. For the 137 years since 1776, there wasn’t an income tax. Although, the first financial crisis happen just after as the states notes that financed things were nearly worthless. Hamilton consolidated that debt and prevented default. As Washington’s Secretary of Treasure, he designed government economics. At the start of government ran on just over 7% of the Gross Domestic Product. This is not actual revenue. It is what government takes from all the goods and services produced across the economy. Money taken for government operation is not available for business growth or as profits to distribute. Taxing for greater revenue is being disputed. Reductions are disputed as bad and benefiting those it should not benefit. Reduced taxes are supposed to prevent government from doing its duty. Yet, when you see the reductions by JFK and Reagan you will see that government revenue quickly recovered. The graph doesn’t quite go back that far but the more recent version and projections based on current spending alarm. Of course what is being spent isn’t just what is coming in. Returning to the first graph gives us a look at past tax reductions and those don’t bare out that it is the cause for damage as the economy reacted, at least to a degree to what was referred to as Voodoo Economic promoted by the Laffer Curve which really goes back centuries. War cost have spiked debt. The worst remain the WW ones. We had a couple of other in my lifetime — Korea and Vietnam. Those aren’t serious spike because we had booming a economy. The Roaring 20’s after WWI and the massive growth after WWII solved those problems. All four were followed by economic growth as industry created much greater revenue. This is the first time we must question growth. As I pointed out the 60-minutes piece in this blog, the taxes being talked about aren’t our serious problem. This article isn’t trying to tell you what is best. I don’t think anybody has that answer. The site I took these charts from has a lot more info in an easily viewed format. It will really help you cut through rhetoric — mine and others. This post was inspired by Wolfie. The post that inspired it was I think of as humor. Humor can cuts to the chase. Thanks for the nice words. BTW, I have no problems with tax cuts, spending cuts, balanced budgets all that other kind of good stuff, my problem is with the rigidness and hypocrisy of the current GOP. They built the current situation by financing the Middle East Wars on debt and deregulating the financial industry and now want to pretend they had nothing to do with it. And who the hell made Grover Norquist king of America where our so called leaders pledge their alliegance to him rather that their country and constituents. And remember, eve though he cut taxes even Reagan was willing to raise them again when necessary. Oh, one more thing, it seems the Tea Party is not totally agaist raising taxes or closing loopholes. If you have seen comments by the top contenders in the race they say the problem is not that the rich aren’t paying enough but that those at the bottom of the food chain aren’t paying their fair share and that should be corrected. Did it ever occur to them that maybe those in that position aren’t making enough to pay more? We aren’t far apart. My problem with tax increase is that pols see it as a solution where it is really part of the problem. The whole tax code needs to be changed. Parties have lied about what they are doing with taxes. There are just to many ways provided to game the system. If they went to eliminating deductions, I am on board. It isn’t the teaer or traditionals as much as the inability to be honest with taxes. They all lie and make it always look like it is the other guy getting screwed. Our tax system is the biggest impediment to job growth. How they screw groups or bribe them may get covered by the new; but it is soon old news and forgotten. Proof we are too soon old and too late smart. 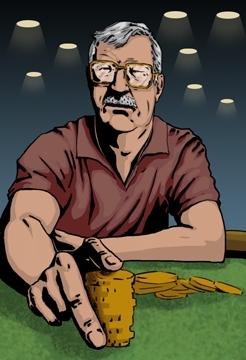 lightning36 on What Does the Average Person Look for in an Online Casino? David Smith on What Does the Average Person Look for in an Online Casino? Ken Prevo on Who da man? lightning36 on Who da man?